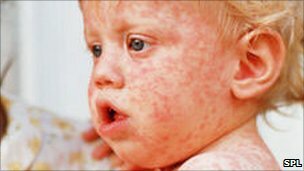 Measles is particularly dangerous in young infants but anyone can get the disease at any time. In the 1990s, experts thought they were close to eliminating measles for good. But now the World Health Organization (WHO) has put back its target date for getting rid of the disease to 2015. But even that seems unlikely. The reason? A measles outbreak which is spreading across Europe, affecting France, Belgium, Germany and Romania - and now the UK. Other significant outbreaks are taking place in Serbia, Spain, Macedonia and Turkey, the WHO says. Over the last few months, the Health Protection Agency has seen an increase in measles cases in children and young adults in England and Wales. Their figures show that between January and April, 275 laboratory-confirmed cases of measles were reported, compared to 33 cases for the same period the previous year. The HPA says these cases are, "associated with either recent travel abroad or small clusters in mainly unvaccinated children and young adults between the ages of 10-24." Health protection units across England and Wales are warning parents to make sure their children have received two doses of the MMR vaccine before travelling to mainland Europe in the next few months. They are particularly concerned that as families plan summer holidays on the continent, and schools organise trips and exchanges abroad, unvaccinated children and young adults will be at risk. Dr Mary Ramsay, head of immunisation at the Health Protection Agency, said: "Measles is a highly infectious and dangerous illness which spreads very easily particularly in schools and universities. It is crucial that children and young adults are fully immunised with two doses of MMR." Letters have been sent to some primary schools and further education colleges in London, where confirmed measles cases have reached 86 so far this year. Dr David Elliman, consultant community paediatrician at Great Ormond Street Hospital in London, has noticed a rise in cases and says it is never too late to be vaccinated. "Anybody can get measles at any time, but it's particularly dangerous in very young children and young adults. Any opportunity people have to visit their GP and ask for the vaccine should be taken." He says one in 15 people have complications with measles and one in 1,000 will die of it, but that the two doses of MMR will protect people against the disease. "Figures show 84% of children had received their second dose of the MMR vaccine by the age of five but we need 95% uptake to stop it going around - and we are still not there," Dr Elliman says. The situation in France, however, is considerably worse. A measles epidemic has officially been declared there, with nearly 5,000 cases reported between January and March this year. The is almost equal to the total number of cases reported in France (5,090) during the whole of 2010. The WHO says France is taking immediate steps to control the outbreaks by vaccinating infants at nine months of age and offering the vaccine to all unimmunised or under-immunised people over that age. Dr Rebecca Martin, the WHO's programme manage for vaccination and preventable diseases in Europe, believes the reason numbers of measles cases in France are so high is down to complacency. "In France they didn't see the disease any more so people thought there was no need to get their children immunised. Rather than put them through two injections and, possibly, a fever afterwards... Their perception of the risk changed." The organisation which oversees public health in France, Institut de Veille Sanitaire (INVS), is worried. In a newspaper article, Françoise Weber, the director of INVS, estimated that the cases already confirmed by health professionals in France are only "the tip of the iceberg". But measles can be eliminated in Europe, the WHO's Dr Martin says. "In the Americas, measles was eliminated in 2002. There are no indigenous cases there now because everyone has been immunised, so it can be done. But it's a slow process and we need to accelerate our efforts."